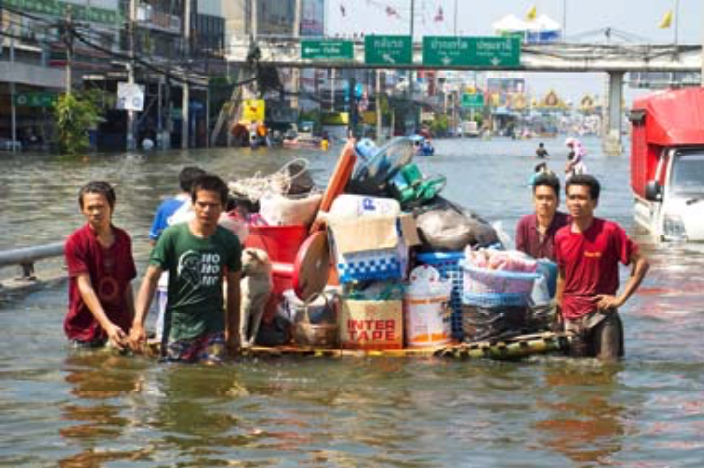 Southeast Asia is one of the world’s most vulnerable regions to climate change. The Asian Development Bank estimated that economic loss in this region from climate change impacts could be the equivalent of 6.7% of GDP by the year 2100, more than twice the world average. At the same time, the region is increasing its greenhouse gas emissions as a proportion of the global total and thus is contributing to the very impacts with which it is threatened. In the face of such challenges, ASEAN has taken steps to promote collaborative action on climate change. The Blueprint for the ASEAN Socio-Cultural Community (ASCC) was launched in 2009. Section D10 on Responding to Climate Change and Addressing Its Impacts advocates for enhanced regional and international cooperation to address the causes and impacts of climate change. Also in 2009, an ASEAN Climate Change Initiative was developed to further guide enhanced regional cooperation, and the AWGCC was formed to implement the initiative. Subsequently, the Action Plan on Joint Response to Climate Change was prepared, identifying specific actions that could be taken by ASEAN member countries. In the lead up to the 4th meeting of the AWGCC in March 2013, Thailand, as AWGCC Chair, recognized that there was no clear information on the extent of possible donor interest in supporting the action items contained in the Action Plan. Thailand considered this a key constraint to implementing the Action Plan. Consequently, USAID Adapt Asia-Pacific was asked to help ascertain the level and nature of interest among donors and other partner organizations with a track record of strong support to ASEAN and/or climate change in the region. This support helped ASEAN member countries to identify potential assistance from an array of donors and partner organizations to implement specific elements of the Action Plan. This was done as part of USAID Adapt Asia-Pacific’s programme of assistance to the Royal Thai Government, serving as Chair of the ASEAN Working Group on Climate Change (AWGCC). In February 2013, USAID Adapt Asia-Pacific mobilized expert support to Thailand’s Office of Climate Change Coordination (OCCC). USAID Adapt Asia-Pacific's consultant conducted a survey eliciting information from donor/partner organizations as to their current climate change programs, identify where the objectives of these programs might overlap with the specific action items contained in the Action Plan, and ascertain the respective organization’s potential interest in supporting the action item(s). In early March, OCCC issued letters of invitation to about two dozen donor/partner organizations with a request for them to submit the necessary inputs as well as to attend the consultation forum during the last week of March. The intervening weeks were spent communicating with the various organizations to secure their inputs and participation. The results of the mapping exercise were presented at a Partners Organization Consultation Forum in Siem Reap, Cambodia on 26 March 2013, attended by 47 people including representatives from 11 partner organizations who presented their positions on support to the Action Plan. All action line items contained in the Action Plan were matched with expressions of interest or support from one or more donors/partner organizations. Feedback received from participants at the Consultation Forum indicated that the mapping exercise was very useful in matching actions in the Action Plan with donors/partners who are in a position to support those actions. The Partners Organization Consultation Forum was immediately followed by the 4th Meeting of the AWGCC on 27-28 March 2013, which also acknowledged the mapping effort. The donor’s matrix was used as a main document to facilitate discussions between ASEAN member countries and donor agencies with regard to their joint efforts in the future to meet the climate change challenges being faced by the countries of Southeast Asia and as identified in the Action Plan. USAID Adapt Asia-Pacific (2013) Support to ONEP/Thailand as Chair of the ASEAN Working Group on Climate Change. Briefing Note. USAID Regional Development Mission for Asia: Bangkok, Thailand.